The client wished to divide the drive area from the garden and create an area to enjoy the evening sun. A curved coursed wet stone wall with an archway was constructed using new building stone from Cotswold Natural Stone Ltd at a site near Abingdon, Oxfordshire. Our wet stone walls are built to various designs by constructing free standing walls from stone with various mortars including lime mortar. You may choose new stone or have existing stone on your site, all stone will require dressing and sizing. 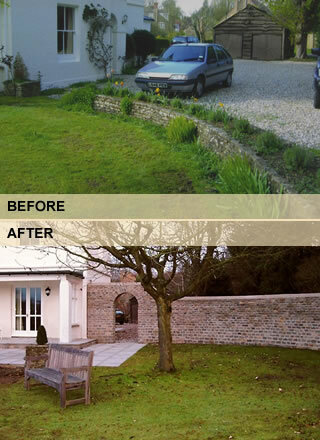 This section of wet stone wall was re-built using the original stone as it had been taken down to provide the access for the re-development of a barn near Woodstock, Oxfordshire. You may chose from a selection of copings, piers, archways and other features. Wet stone wall archways using reclaimed weathered Cotswold stone were constructed as an entrance to two cottages near Great Milton, Oxfordshire. These walls were designed to create a courtyard garden at a property near Henley, Oxfordshire. They were coursed wet stone walls using new stone from Cotswold Natural Stone Ltd with a half round coping. This random wet stone wall was constructed using reclaimed weathered Cotswold stone to divide a garden from the adjacent car park in Summertown, Oxford.